I have been thinking about writing this blog for what seems like forever, I’ve just not known where to start. I’m a backpacker, I sleep in hostels and do things on the cheap; I don’t spend the amount of money that could last me a week on a room for one night. Except that’s exactly what I did in Singapore but how am I meant to write about something so luxurious when I have nothing to compare it to. Not only that but staying in the Marina Bay Sands hotel was our last night before our year long trip ended and that is not something I’ve wanted to think about since returning back to ‘normality’. The boyfriend and I coughed up $575 (Singapore Dollars so a little under £300) for a room, with a city view and breakfast at the Marina Bay Sands. You may ask why I did this, what is so special about this one hotel when you can get up to the viewing deck without being a hotel guest. Well two words: INFINITY POOL. 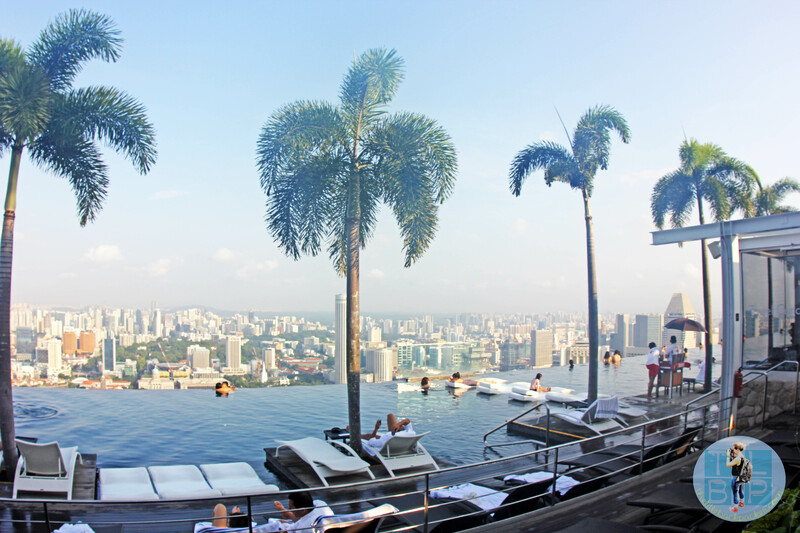 Chilling and swimming in that famously high swimming pool has been on my bucket list since it first opened in 2010. So what was the stay like?! We arrived bang on arrival time at 3pm. 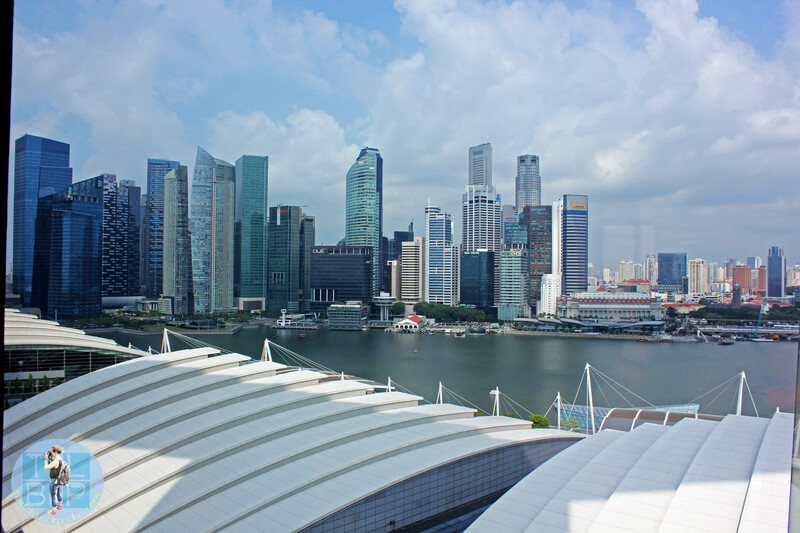 It is easy to get around Singapore on the MRT and it stops directly at the hotel – just make sure you get off at the right stop, you need Bay Front not Marina Bay like we thought! We checked straight in and were given the choice of a double room on a low floor or a twin room on a higher floor. We took the higher view over the double bed, as they were going to push the beds together and remake it for us anyway. I was a bit shocked at the fact that was all they could offer us when I had booked a double room with a view. The hotel is split into three towers and we were in the third tower (the one nearest the flyer) and on the 20th floor. When we walked into the room I instantly forgot about the fact we had two single beds – it was amazing – but then that is coming from someone who has only ever stayed in a hotel like this in Vegas. So spacious and even from floor 20 the views were incredible. We sat in the room for ages not knowing what to do with ourselves, everything was amazing; beautiful room, a hotel complex even bigger than I imagined and the anticipation of jumping in the infinity pool. Not only that but being at the hotel also meant this was our final days of our round the world trip, the last travelling we had booked was coming to an end. We quickly scanned the booklets left for us about dress codes etc. and then headed to the pool. We made our way up to floor 57, handed over our pool cards and were given a wristband for the day – I was really getting to do this. Then I saw the pool, it was incredible beyond words, it looked just like the pictures but much nicer at the same time. The views from this height were stunning, you could see for miles upon miles. Being able to see away from the city, out at the water full of commercial shipping boats full of containers was unexpected. The top deck was lined with palm trees and sun loungers overlooking the pool along the edge of the city side. At each end was a restaurant as well as a viewing deck above tower three. There was another club/lounge area in the middle but that was only for people in suites or gold rooms (well something like that anyway). I jumped straight in to the pool and over to the edge to check it out. It isn’t until you get right up to the edge do you see the water catch and staff walk way below, otherwise it’s so scary approaching the edge. The pool is everything I imagined and totally makes staying here worthwhile. As the sun began to set we quickly ran for our cameras, and my am I glad we did. The sunset was gorgeous with it setting behind the tall city buildings creating some fantastic shadows on the water. After the sun had gone, we headed back to our room to change for dinner. We didn’t have dinner included in our room so chose to eat at one of the restaurants in the shopping mall area because it was more affordable than in the main hotel. We found a massive casino in this area too. After dinner we spent the rest of our evening checking out the viewing deck until they asked us to leave at 10pm when it closed. Realising the pool was still open for another hour we grabbed our swimming stuff and enjoyed a night swim. It certainly felt a lot more magical in the dark. I had the comfiest nights sleep but we forced ourselves out of bed at 7am not wanting to miss a thing of our last day travelling. Opening the curtains, we were instantly awake with the gorgeous view of the city. We opted for a quick morning swim and were delighted at how little people were around. We soon found out why – with the sun having only just risen the water was chilly and I didn’t last long in the water. We changed and headed for breakfast at the Sky 57 restaurant – both our dinner and breakfast was delicious but I’m saving the details for another blog. We checked out just after ten even though we had until eleven – we wanted to beat any queue, get our things stored away and a decent sun lounger before everyone else did. The price was exactly as quoted online as we didn’t use any room service or such. We then spent our final day at the hotel and of travelling by the edge of the infinity pool. I think it is great they let you spend the whole of check out day using the hotels facilities. We had a fantastic day of swimming, sunbathing and remembering everything we had done in the last year. The only downer was when we ordered food the waitress dropped it before reaching the table and the tomato ketchup landed all over my brand new bag. I was left to clean up the mess myself however the manager did come over and apologise for it all. Despite that and getting extremely sunburnt we spend the day doing exactly what I had come for…. chilling out at the infinity pool. Everything about our stay here was fantastic; the staff go out of their way to be friendly and helpful – even enthusiastically taking photos of you by the pool when you know it’s the millionth time they have been asked to do such a thing. 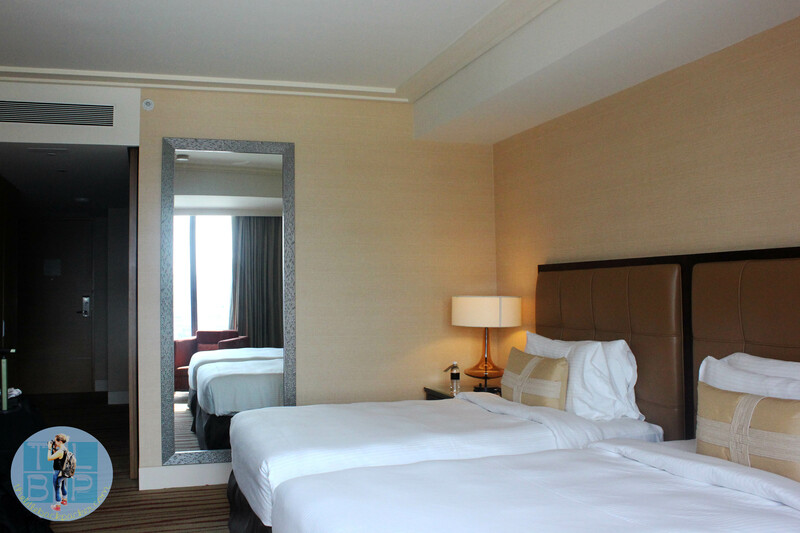 The hotel itself is spectacular inside and out with a light airy lobby and then cosy modern rooms. The infinity pool is incredible and the reason for spending the night here – it can only be accessed by hotel guests. We even had our bags stored safely for the day and were provided with a key to a communal room to shower/freshen up in before heading to the airport. This was our biggest expense of the year (except flights) and the most luxurious place I have ever stayed. For me it was totally amazing and totally worth it but then the only thing I have to compare it to is the Monte Carlo Hotel in Las Vegas and that is very different. 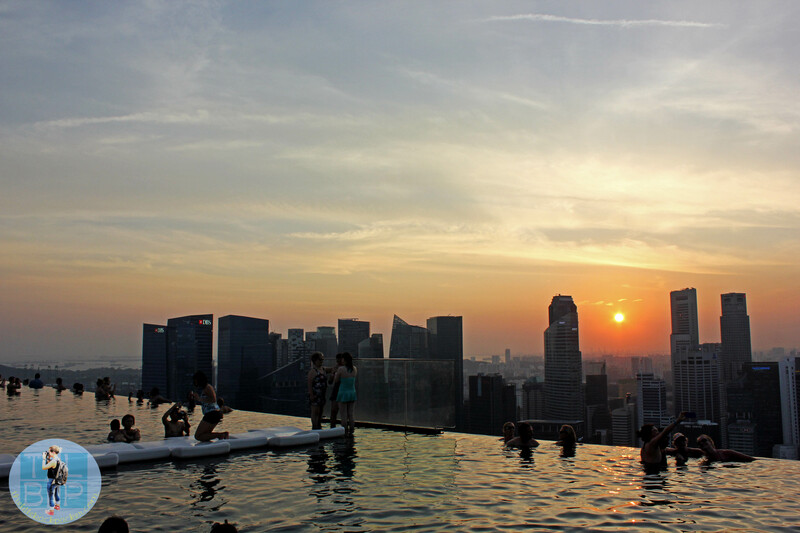 Have you ever stayed at the Marina bay Sands Hotel? What did you think? Or is it on your bucket list for the future? MBS has to be one of the world’s great hotels. I can’t say we were welcomed with open arms but we were not treated poorly, looked down up or any such negative feelings. Thanks Hannah, I’ve stayed in many hotels since this one and still nothing has been as amazing as my experience here.